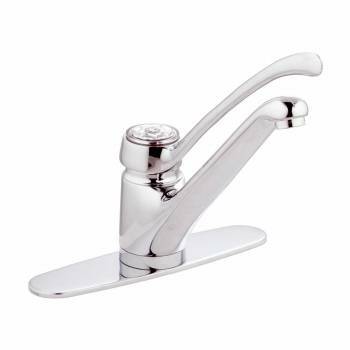 Kitchen Faucets that are unique and very well built. Choose your Kitchen Faucets here today. Has durable, one-piece cast-brass valve bodies? Is triple-plated with brilliant chrome? 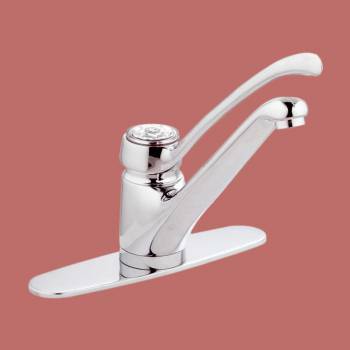 Has a single, modern-look chrome lever handle? Can be mounted as either a single hole or 8" set? Kitchen Faucet: Crafted in cast brass and finished in chrome, this kitchen faucet is designed in a classic style with a high spout and single lever function. It can be mounted as either a single hole or 8" set with the included plate. Washerless. It measures 8" high by 9 1/2" wide with a 9 1/4" projection.